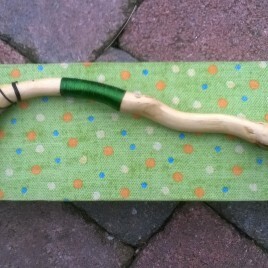 These wands are my latest project. 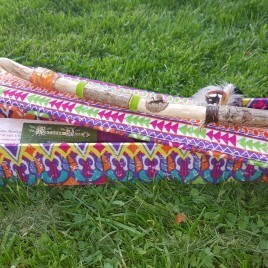 I started collecting sticks last November on my regular walks around beautiful West Wicklow. 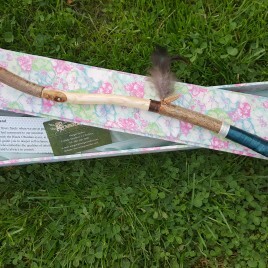 When I see sticks on the ground as I am walking I see magic and through a meditative creative process I transform the throwaway stick into an exquisite wand, whittled, sanded, painted, polished and set with crystals according to the energy of the piece, Ash, Oak, Beech etc….. 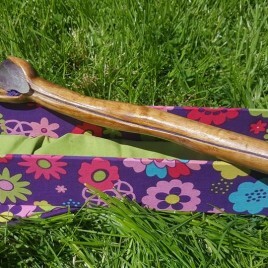 The finished product is a once off unique and beautiful piece of art presented in a corresponding box handcrafted especially by Robbie my husband, which is also made from wood and material to blend with each particular wand. Made especially for a child for the inner child of an adult!! It is twisted Ivy, reminding us to allow things to enfold in our lives in a free flowing way – accept the twists and turns that show us our life path. The colour red incorporated with copper wiring reminds us to keep in touch with the element Earth. Children and adults need to be rounded and the best way to do this is to allow nature to bring them –‘back to earth’. 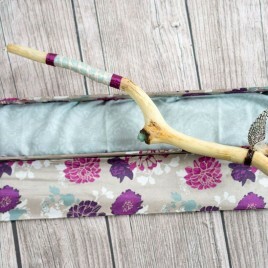 Balance Wand To lead a healthy life, physically, mentally and emotionally we need to find balance in all that we do. The Balance Wand is the perfect partner to have in achieving this balance. On one end of the wand we have Lady Guinevere, one of the most beautiful and nobel queens representing the Feminine side and on the other end of the wand we have the Maoi Head from the Easter Island, the powerful Male energy needed for Ying and Yang energy. Tune into the Amethyst Crystal for deep wisdom. 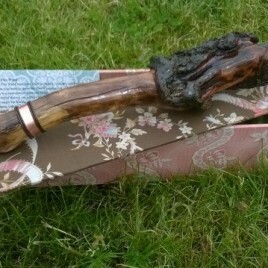 Holding this wand with both hands we ignite the power of Deep Faith. We hold in the palm of our hands, the power to create all that we want and behind this knowing and believing that it will happen. Amethyst brings great wisdom and protection, and notice the colour purple runs all the way down the wand to Rose Quartz which keeps everything in a heartfelt place. 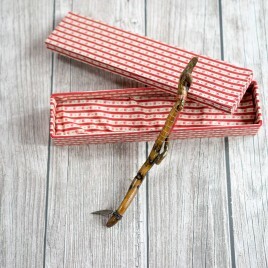 This is the wand that will help you with conceiving ideas, planting the seed for your next venture and bringing it to life and making it a success. Watch out for the Rabbit whose power knows when to run, zig zag and when to stay still and listen to your inner guidance. They are also known to produce little ones quite often and easily! 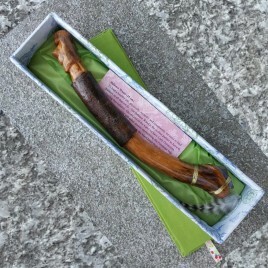 At the end of the wand is the Tiger Eye crystal, which adds courage to the whole process. 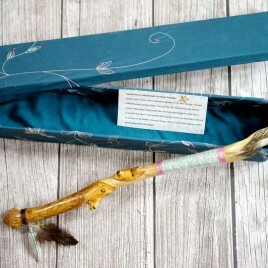 The Fire Wand represents Spirit in Motion. Use this wan at times when your need to ignite the fires of passion - to make things happen. Fire is a masculine element and brings us into a place of personal power - our belief that we can achieve what we set our hearts on. 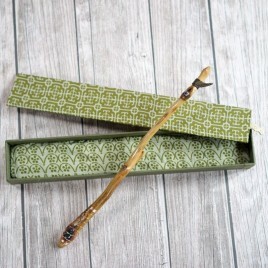 This Fire Wand has magic for healing, purification and destroying bad habits. It brings balance with the help of Green Tourmaline Crystal at the top with its excellent healing qualities and it also promotes compassion, patience and belonging. 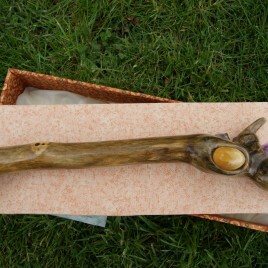 The true power of this wand lies in the power of letting go. Allow life to happen and reduce the struggle that comes when we resist what is happening in our lives. Find the baby elephant. Elephant animal power feels deeply and responds to life with attuned inner knowledge and their big ears can help us deepen our listening skills. Amethyst for wisdom, Smoky Quartz to keep you grounded and as an antidote to stress. Breadth in Carnelian as it helps you to trust yourself and your perceptions. Merlin the Wizard was the last of the Druids, a Celtic Shaman and keeper of knowledge. He shared his wisdom where it was most needed. 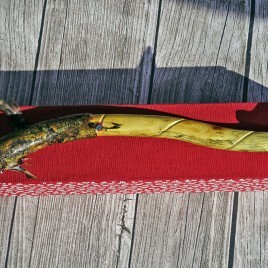 Use this wand to bring you back to your own internal compass of wisdom and power. Aquamarine crystal is a stone of courage and it has an affinity with sensitive people. It is perfect for bringing closure to situations, and it can break old self-defeating behaviours.